Mehmed Özkan, the controversially-appointed rector of Turkey’s prestigious Boğaziçi University has cancelled a scheduled speech by Selin Sayek Böke, the spokesperson of the main opposition Republican Peoples’ Party (CHP). Böke was set to deliver a speech titled “Leadership in the new economy,” during a two-day summit organized by a student club at the university on March 18 and 19. 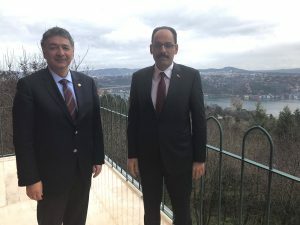 “The Boğaziçi University rector who hosted the presidential adviser [İbrahim Kalın] at the school only a few days back has cancelled my program,” Böke tweeted on Thursday. In mid-February, Özkan also cancelled a panel the outspoken government critic, Sera Kadigil who is also a CHP member. The AK Party government issued two post-coup decrees in November, 2016, and canceled the intra-university elections that used to be held to elect university rectors. Days after the decrees, Özkan was appointed by the president Recep Tayyip Erdoğan as the new rector of Boğaziçi University despite a different result from an intra-university election that was held prior to the decrees. The cancellations came only weeks before an April 16 referendum through which AK Party government seeks to give more powers to Erdoğan in an executive presidency.